Public education department has already announced the target that every student should obtain A+ in the academic year 2019-2020. Labour India’s objective is to have the same target fulfilled.To attain this target, we have included all the possible questions that can be expected from each chapter along with their answers in our journals. The flow charts and mind maps related to each chapter have been prepared so that it will enable you to recall the chapter. The models of flow charts have been included so that students can expand those charts and add required pictures as per their requirement. As you go through each chapter, work out the questions given in this Question Bank. Then you will be able to manage any exam easily. Obtain self-confidence. Then you won’t be scared of any exam. Once you are confident of the answers, you need not be scared of any change in the question pattern. 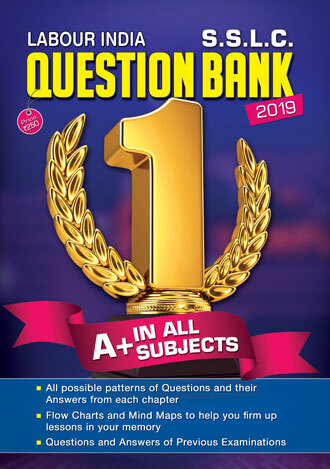 Labour India S.S.L.C Question Bank will certainly help you face any exam without examophobia.